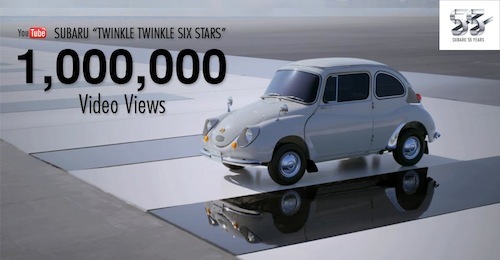 Subaru is celebrating 55 years of the brand and created a brilliant acoustic masterpiece called “Twinkle Twinkle Six Flags” that has drawn over 1 million views. You can view it here. It's been 55 years since Subaru introduced their first car, a Subaru 360, on March 3, 1958. Subaru pulled out all the stops for their 55 year anniversary and created a brilliant acoustic masterpiece performed by key models from the first Subaru 360 through to today's lineup driving in concert over a gigantic keyboard. The video has been a huge hit with Subaru fans and has already been viewed over 1 million times. What has made the brand and the video so popular? The video below is called “Twinkle Twinkle Six Flags” and the title implies Subaru’s hope to get the Pleiades sparkling in the Subaru logo toward the future. This video has been created to mark 55 years of the Subaru brand and they have a lot to celebrate. In the last few years Subaru has brought out new vehicles that are appealing to a new generation of buyers. They have moved from been a quirky little automaker to a mainstream force that is getting peoples attention. They got a toethold in the U.S. market in 1968 when Malcolm Bricklin imported their first car into North America. Their first car was the 360, a minicar with a 25-horsepower engine that was slower than a turtle and needed 37 seconds to get from 0-50 mph. At the time, Consumer Reports called it the "Most Unsafe Car in America." Despite their rocky start, Subaru developed their niche in the market by building an all-wheel-drive system for its cars and continually upgraded its boxer engine. They appealed to a consumer who was a bit offbeat and exploited the brands differences. Fuji Heavy Industries Ltd (FHI). who is the parent company of Subaru made two important decisions that continue on today. They equipped all the vehicles it sold in America with all-wheel drive. Then they created a high-trim version of its Legacy station wagon with SUV design cues, and named it the Outback. After hiring Paul Hogan of Crocodile Dundee fame as its spokesperson, the Outback slowly caught on and is today Subaru's biggest seller. Today we see Subaru executing a strategy of controlled expansion designed to boost unit sales and build profit margins. It has created the new 2013 XV Crosstrek that is an Outback-like version of the Impreza that sells for a premium price after raising the suspension and adding new bumpers and body cladding. And it’s giving its performance models, now known as the Impreza WRX and Impreza WRX STI, standalone identities by dropping the Impreza name. They entered the sports car market by jointly developing the BRZ two-door coupe with Toyota that has been selling well all over the globe. And with the introduction of the all-new 2014 Forester crossover, they should see record sales again this year. Since Toyota owns 16.5 percent of FHI, having doubled its stake in 2008, look for Subaru to have access to technology and that will speed its expansion into more global markets. Subaru certainly has come a long way since 1958 and has reason to celebrate 55 years.